This year's flag is made from my favorite--reclaimed wood. I wanted to use different bits of pieces of wood scraps to create the flag. I secured them to a piece of plywood with a nail gun, and then painted it and sanded, finished her up with some wax. Last year's flag was quite similar to this year's, made with reclaimed wood. I have made a picket fence flag. And a flag on a suitcase. I love the red, white, and blue and I feel like I need to give a disclaimer: I realize these are representations of flags, but they still remind me that we are blessed to live in the USA, land of the free and we need to honor those who have and do still fight for our freedom. I have the upmost respect for the American flag, am happy to live in a state where our school kids still salute it every day, know all the words to the Star Spangled Banner, and even know how to properly fold a flag. Long may she wave! I love them ALL, but wow... your most recent one is amazing!!!! I'm with Donna, your most recent one is my favorite...gorgeous!! I might have to add a similar disclaimer to one of my posts! 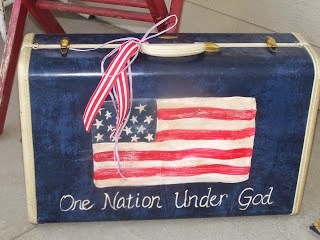 Fabulous patriotic flags, I love them all, specially the vintage suitcase...adorable! I love rustic flags! The book page one was really fun too! Beautiful! Love the different textures of wood you used and the perfectly distressed paint. It certainly is a work of art! Thanks for sharing!